This easy 30 minutes side dish is a perfect sidekick to any meal! 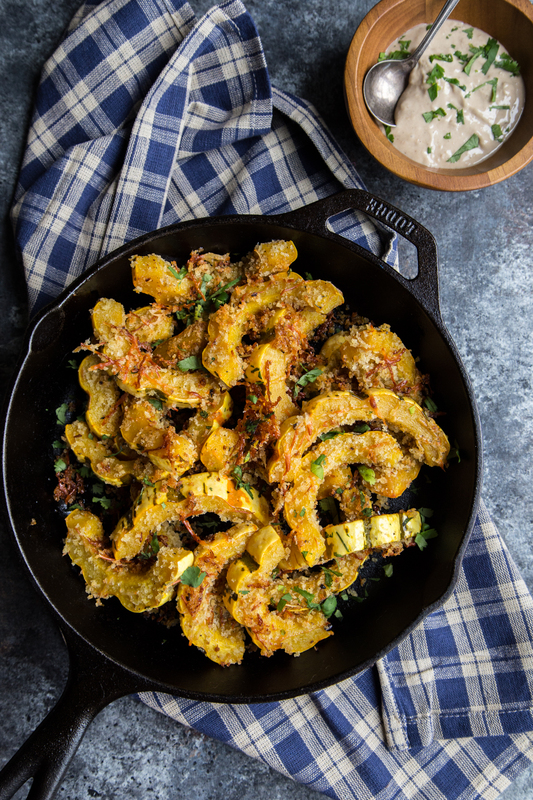 Garlic parmesan crusted delicata squash is super fast, and there is hardly any prep required! Hi! I know it’s been a while. I dropped a big bomb in my last post about blogging, and then totally ghosted my own site. Not intentionally, but in a way it might have been a good reset to it all. The truth is that I have been so bonkers, coo-koo cachoo at work that I haven’t had the time or the energy to be behind my computer for the last couple of weeks. And anytime that I get close, there is a tiny little tater tot who insists on my time, energy, love, and snuggles, so he kinda wins out. But this weekend, I got to jump back in and I had to show you this recipe right away. On Wednesday this week, we open up the first five gates at the project I have been working on. It’s been a long time coming and it has been all hands on deck since new year. It’s exhilarating, nerve wracking, and every emotion in between. My resolution for getting more activity into my day has been a raging success, with last week getting 15,000 steps in on Friday. It made up for the birthday lunch I had with my friend Kabri, when I had to hit up the sweet potato fries at the restaurant because the aioli they serve them with is just bananas. And the dessert I got to celebrate. She got the vegan chocolate mousse which was to DIE FOR. I had dessert envy. But it also got me thinking about something I saw on the internet, that said “That 5 to 10 pounds you’re so worried about? Well, that is where life is. That is the coffee you had with a friend. It’s the birthday cake you had to celebrate a loved one. It’s where your memories are made.” And I had to stop and think about it. It was me. I’m still a few pounds over my pre-baby weight. But I eat healthy most days, but I know I never turn down piece of chocolate. Coffee with my friends from work is important to me, not just because of the caffeine, but because it’s 20 minutes of connection. We talk work, life, love, challenges, and strategize our days, but it is a piece of my day that gives us a chance to be human, be friends and pause in the chaos of everything else. It’s not just the coffee, it’s life. So for a new year, eat the healthy veggies. But don’t forget to live life. Don’t forget to savor it however you see fit. Don’t beat yourself up about the treats, the smiles and the time with others, just for the sake of 5 or 10 pounds. Be your best self, but know that you’re perfect. Just as you are. 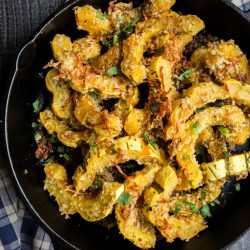 1 Large Delicata Squash, halved, seeded and sliced into 3/4″ wide strips. In a gallon zip lock back, add in the olive oil, salt, pepper, garlic, and pepper flakes. Mush that around to mix it evenly. Add in the squash. Seal the bag and gently toss the squash to coat it all in oil. Open the bag and add in the panko crumbs and parmesan. Seal the bag and mix it all together again gently to coat the squash. Lay out the squash on a silicone lined baking sheet. 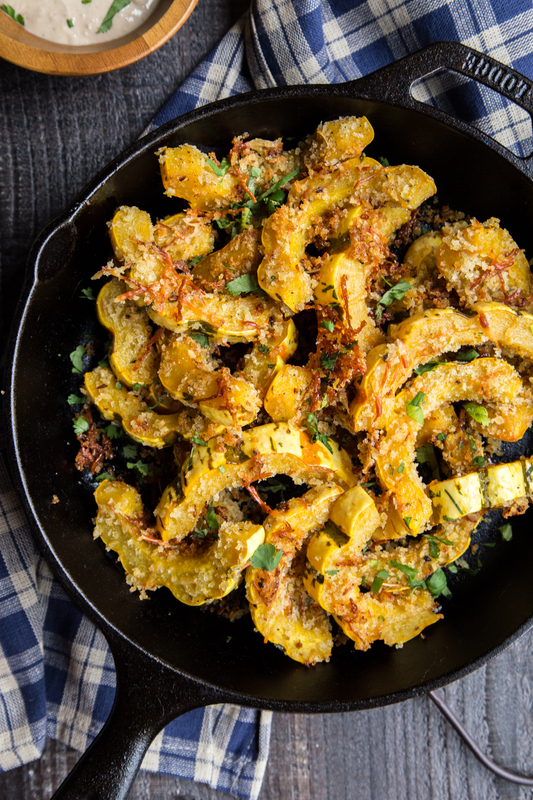 Sprinkle any of the panko and parmesan that might have gotten left behind in the bag, on top of the squash. Bake for 20 minutes, or until the squash is tender. Serve immediately with parsley sprinkled on top.